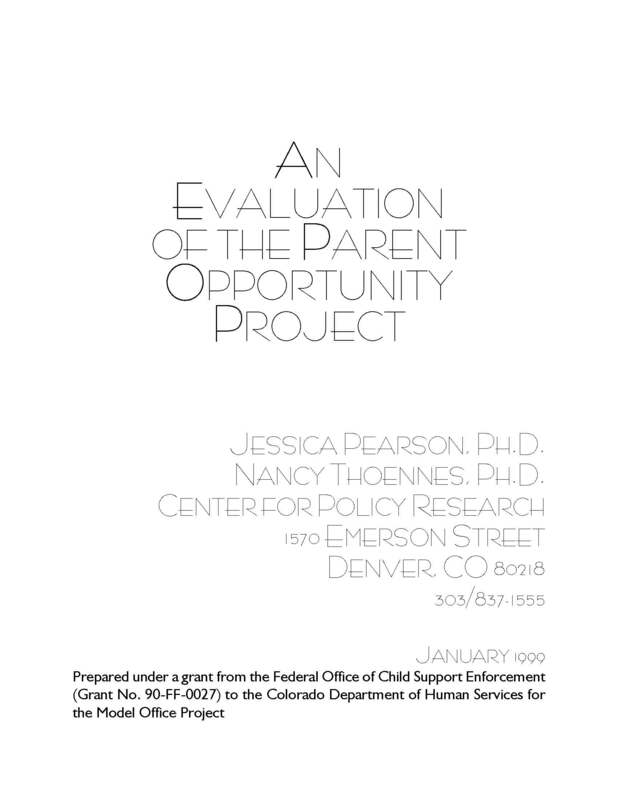 In 1996, the Denver Division of Child Support Enforcement initiated the Parent Opportunity Project (POP), a project aimed at linking low-income, non-custodial parents to a variety of services with the objective of increasing their ability to pay child support and maintain contact with their children. Modeled after the Parents’ Fair Share Demonstration Project, POP involved recruiting un- and underemployed non-custodial parents who were not paying child support and providing them with employment assistance, individualized treatment by the child support enforcement agency, help with access and visitation, participation in regular peer support groups aimed at enhancing self esteem and promoting parenting behaviors, and case management. The Center for Policy Research (CPR) conducted a qualitative and quantitative assessment of POP that included collecting demographic information about POP participants, their referral for various services, and monitoring outcomes with respect to child support and employment over a six-month period of time. In addition, CPR conducted a focus group with participants and interviews with program architects and service providers to gauge the perceived impact of POP and its utility.